As one of the leading providers of commercial partitions in the UK, Stodec Products stock a range of steel partitions suitable for all variety of industrial environments. From single skin Sigma or Bastion systems to double skin Elan material, our steel partitions help you to make the most of the available space on your premises in a safe and attractive manner. The experts at Stodec are available to offer free advice and assistance regarding your specific requirements, and can carry out site surveys to help design and install the system most suited to your needs. For more information, get in touch with Stodec Products today. Steel partition modules have some significant benefits over other types of partition. They are factory finished (High quality powder coating), arrive on site ready to install & allow for fast site installation with minimum disruption. Future changes & modifications are easily made & partition walls can be relocated without damage. Our range of panels include very economic single skin steel walls up to sound & fire rated double skin enclosures. One system is designed to be used in clean room & laboratory areas. Over 33 Years' Industry experience. Wide range of advice, with site visits, loading data & support services. Experienced project control team - with partner links for all contractors. 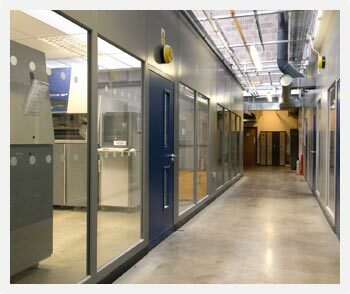 Specialists in clean & controlled environment rooms. Access to design data, manufacturing & warehouse stocks. Wide range of products from market leading manufacturers. © Stodec Products 2019 All Rights Reserved.